Do you ever wake up and just know it’s going to be one of those days? This was one such morning. I’d gotten myself an extra pastry for my trip out to Sintra the day before but never ended up eating it, so it sat in my ICPhS tote bag on the floor next to my bed. I started to get ready for the day and pack my tote and discovered it was swarming with ants (shudder). Thankfully, Susanne had given me her ICPhS tote bag as well since she didn’t want it, so I just threw out the entire tote with the pastry and ant infestation along with it. Onwards and upwards, right? In my research, I’d spotted an interesting café that would make an excellent breakfast spot (Tartine), so I set off in search of it. 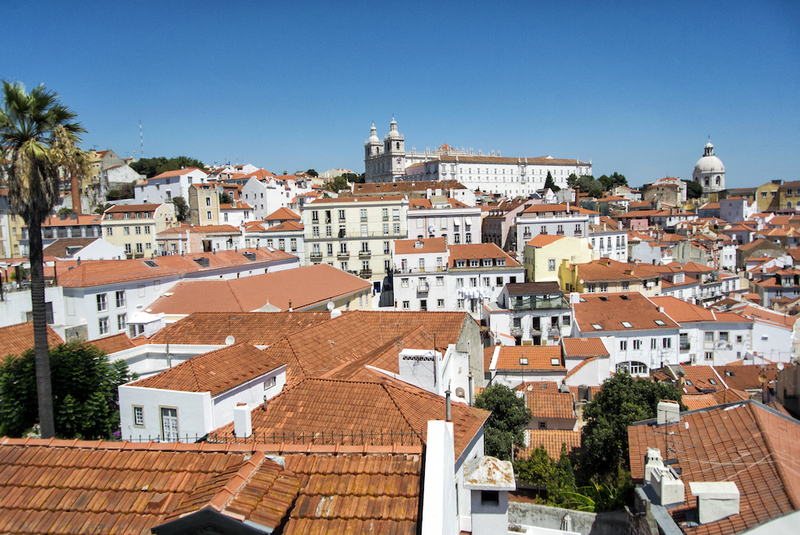 I headed up through the chic Chiado district, which definitely felt a bit glossier and more upscale, with its wide boulevards and trendy boutiques. I successfully located Tartine only to discover, of course, that it was closed for a holiday for the next few days. I still was determined to have something for breakfast, so I meandered up the street and popped into an Art Deco bar/café and grabbed myself a ham and cheese croissant. One of the first things on my list for the day was to catch the number 28 tram. 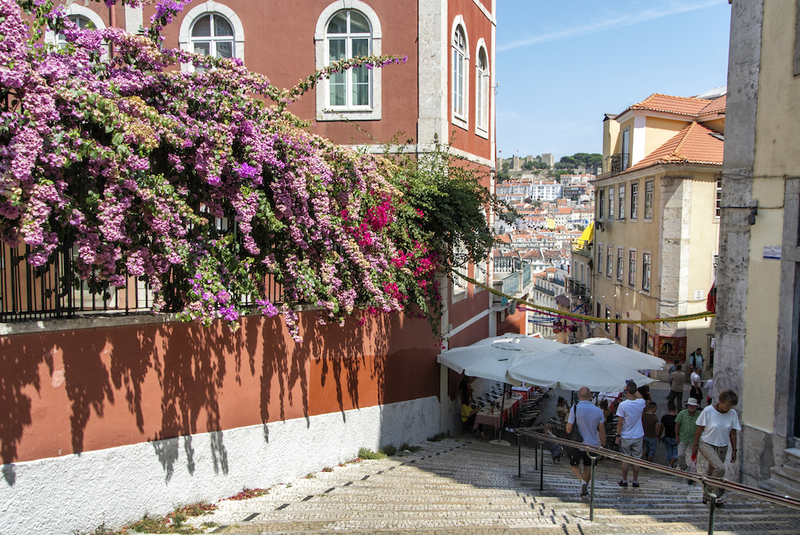 This famed tram route starts in Baixa and climbs up the steep hill into Alfama (which is what most people ride it for) before it heads back down the hill and out into westward districts. I had read that this was a highlight of any Lisbon visit, so naturally I figured I’d check it out. I was warned that lines could get long, so try to get there earlier rather than later. Well, mid-morning certainly wasn’t early enough, as there was already a lengthy queue. I rather resignedly joined it and discovered that it was a very slow-moving line if only because the trams hold 20 or so people at a time and seemed to come every 15 minutes or so. So yes, in keeping with my day, I waited over an hour to board the tram (I had also annoyingly forgotten my headphones). About half of the wait was in the shade, but a good portion of it was in full sun. You may ask, why continue to wait? And indeed that thought did cross my mind several times, but there comes a critical time point when you’ve waited in line just long enough that you think you’ve already committed, so you may as well continue waiting. At long last, I boarded the tram and managed to snag one of the last seats. We were soon whizzing along, alarmingly close to buildings and road signs. I stuck my head out as far as possible to see what I could. It wasn’t long before we had crested the hill, with lovely views of the Church of São Vicente of Fora and the river, though somewhat obscured by the heads of the other tram passengers. 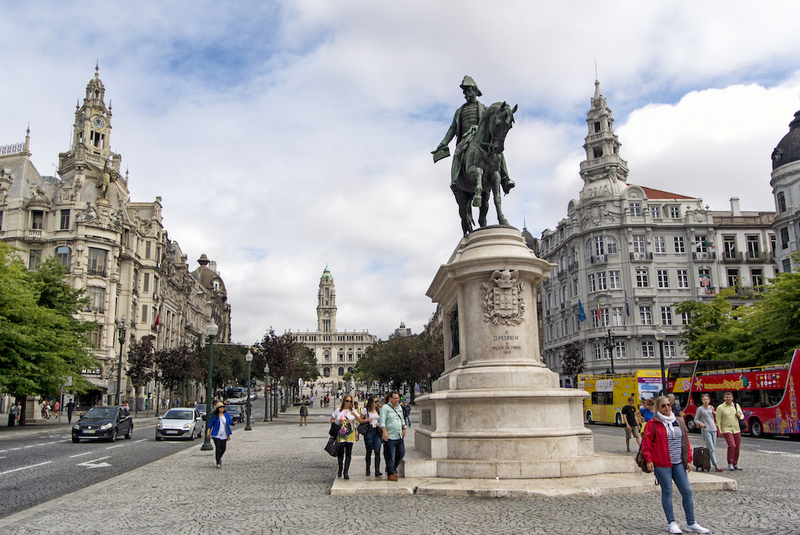 I made a mental note of the plaza as we continued onwards, past Lisbon Cathedral and back into the Baixa district. 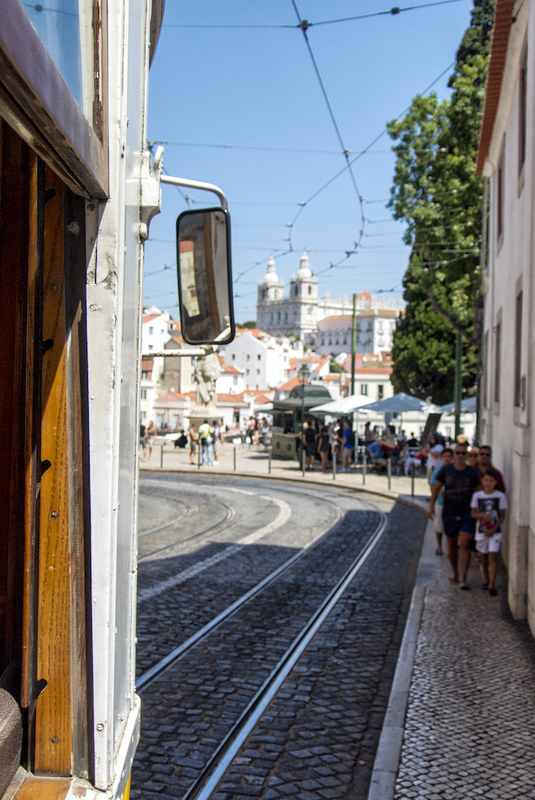 I ultimately didn’t get off the tram in Alfama, largely because I’d waited so bloody long to get on it. I ended up riding it past the city centre all the way out to Basilica de Estrela in the west part of town (I didn’t actually know where I was at the point). I had noticed number 28 trams going in the other direction, so I figured I’d hop on one and head back the way I came. Luckily, I only had to wait about 5 minutes before one arrived (with basically no line). From this I deduced a Lisbon tourist top tip: instead of waiting for an hour in Baixa, just hop a bus out to Estrela and catch a number 28 tram going back towards Alfama. I was definitely pleased to have so easily gotten back on the tram (and managed to grab a seat near the front, so that when I stuck my head out the window, there were no heads in front of mine). 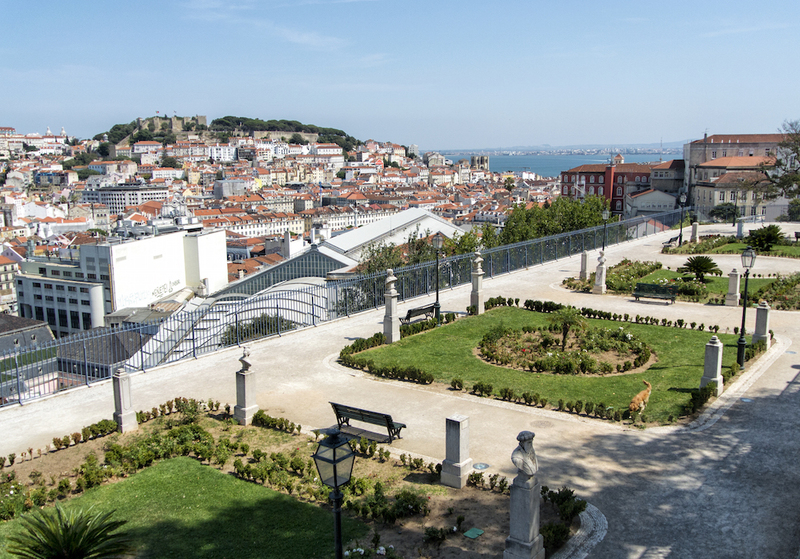 We wound our way through the streets and back up to Alfama, where I hopped off to take in the view at Miradouro de Santa Luzia. It was a gorgeous day, and the sea of red-tiled roofs positively gleamed. I sat on an outdoor patio and sipped a lemonade, taking in my somewhat hard-earned view. 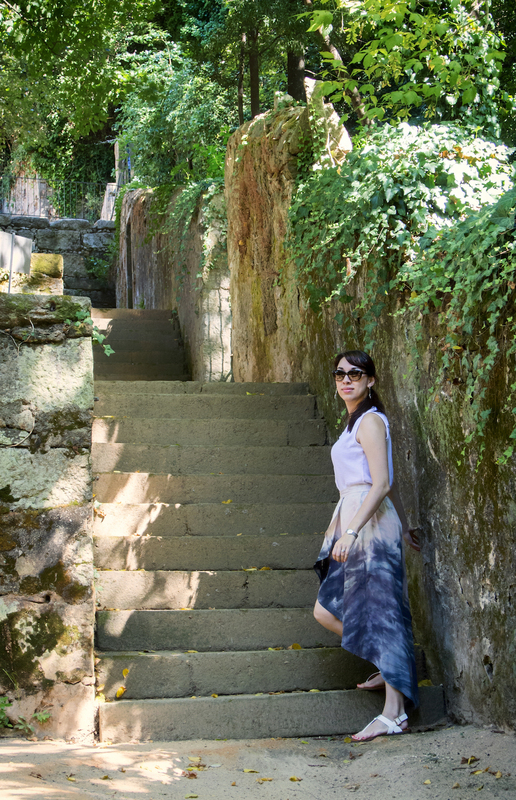 From there, I made my way down the steps and into Alfama, the oldest district in Portugal (and one of the few areas that survived the great 1755 Lisbon earthquake that leveled most of the city). I wound my way through the labyrinth of quiet, narrow streets. I eventually spotted a few pieces of art on display with the caption that they’d been in part painted with coffee and red wine. Intrigued, I perused the little shop, which had a multitude of interesting and unique paintings, using a combination of Japanese ink and occasionally coffee and wine. The smaller paintings were only 5 Euros and the larger ones were 15, so I couldn’t help but grab a couple pieces. One of my favourite souvenirs when I travel is local art, something small and fun, not only because it supports local artists but also because it is so much more unique and memorable. Happy with my purchases, I continued onwards and passed by Pois Café, whose name I remembered from my guide book so I popped in to get some lunch. It had a great kind of Bohemian quality to it, with couches and mismatched furniture, books and art and generally convivial atmosphere. I sunk into a comfy couch and ordered a glass of wine along with a leek and 3 cheese pasta dish (both of which were tasty). 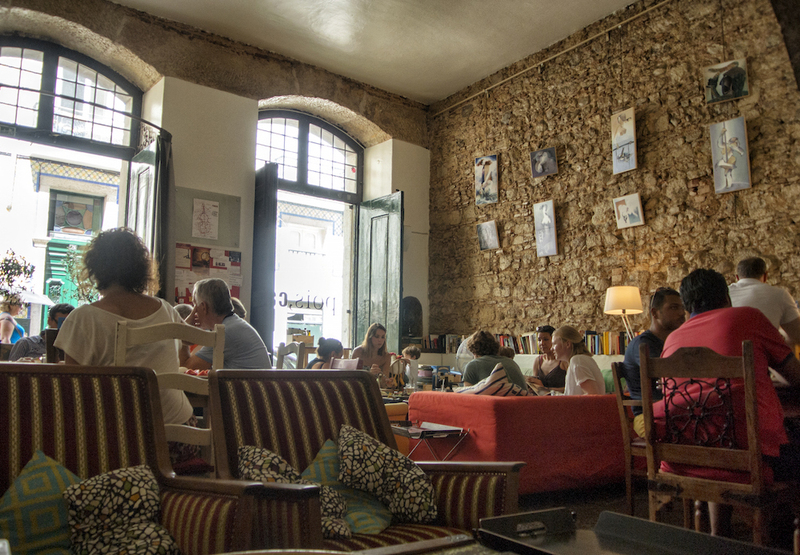 Pois Café was just around the corner from the massive and imposing Lisbon Cathedral. Finished in the 13th century, this Romanesque style cathedral was an interesting combination of austere and ornate, with the area around the altar adorned with brightly-coloured paintings, in contrast with the cold stone of the rest of the cathedral. I didn’t spend long in the cathedral, as it wasn’t terribly extensive. I headed back to the apartment to take a break from the heat, which was thankfully not too far from where I was. I lounged until later in the afternoon before heading back out again to catch a bus bound for the Lisbon Oceanarium (about 30 minutes away), purportedly the largest indoor aquarium in Europe. I did make a brief pit stop at Amorino, an Italian Gelato place I first discovered in Paris (and have now learned has a location in Chicago!) to get 2 delicious scoops of gelato. I’d pre-bought my ticket, to avoid any additional lines, so it wasn’t long before I was face to face to droves of fish. 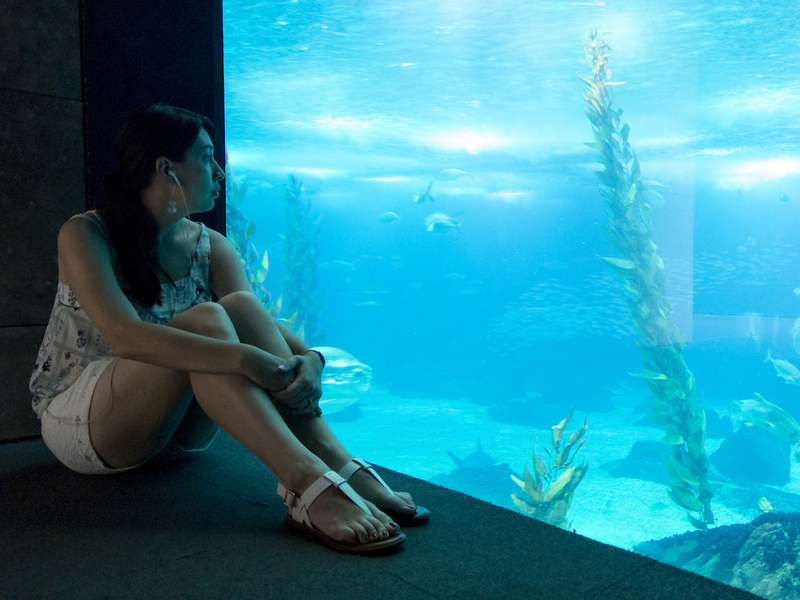 The big feature of the aquarium is a massive, 5000 cubic metre tank, teeming with sea life. It wasn’t long before I spotted a sunfish, the heaviest bony fish in the world. It wasn’t definitely odd looking (kind of like a large flat rock with wings). I also spotted several shark and rays (including a devil ray). Unsurprisingly, there were also droves of families with loudly exuberant children. Now I appreciate the value of educating children about ocean life, but I don’t necessarily want to hear the process. So I happily put my headphones in and enjoyed a musical soundtrack to my time wandering through the aquarium. I visited the penguins and, of course, the sea otters (who are always my favourite), the sea horses and moray eels. I enjoyed just sitting and staring up at the giant windows into the hypnotic traffic patterns of sea life. Once I’d had my fill of ocean-y goodness, I hopped back onto a crowded bus headed back into town. I practiced my first position turn out, attempting to be as thin as possible with people squeezing by and jostling for a standing position. I eventually made it back to Alfama and enjoyed the low, warm dusk light filtering in between the buildings. I made a brief pit stop at a wine bar for a glass of sparkling wine before heading over to Cruzes Credo for dinner. I’d passed it on my walk up to the Lisbon Cathedral (just a few doors down from my lunch spot) and noted it, since it was also a name I’d recognized from my guidebook. When I arrived, they didn’t have any available tables, but the friendly (English-speaking!) waiter said I could order a drink while I waited outside. 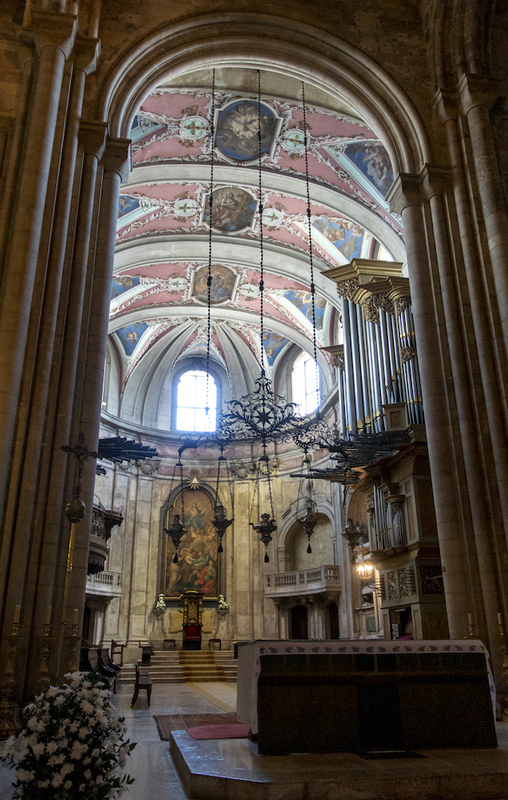 So I happily sipped my sparkling wine on the street and craned my neck up at the Lisbon Cathedral. I eventually got a table inside and ordered a cheese plate and toasted bacon and brie sandwiches. The waiter did warn me that the cheese plate was fairly sizable, but I assured him that I’d be OK. This is cheese after all. Everything was delicious, especially the chèvre and brie (I’m not going to lie, I did prefer the French cheese over the Portuguese cheeses). 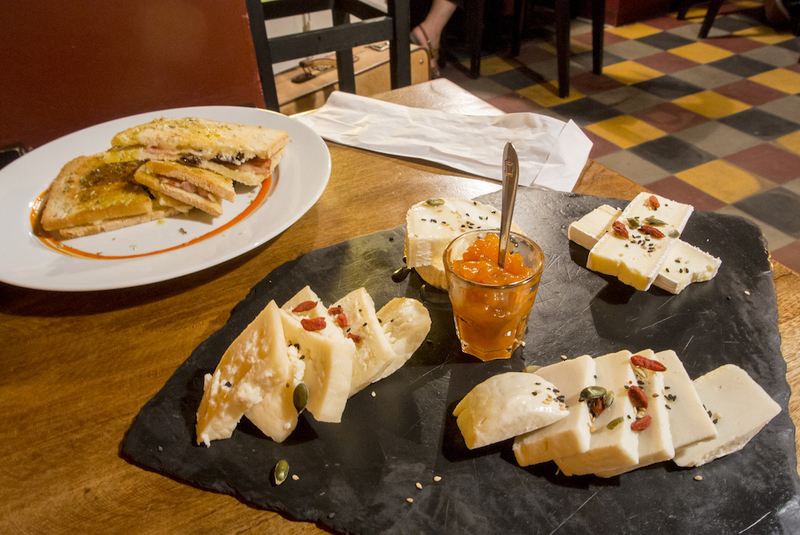 It was a bit of a slog, as I attempted to work my way through the cheeses, and I eventually gave in and asked for a doggie bag, wrapping up about a third of my foodstuffs to take with me to the apartment, which was only a short waddle home. My first full day of Lisbon was actually not spent in Lisbon itself but in a town not far away called Sintra. This place is particularly notable for bursting with palaces and villas. I had bought my train ticket the evening before (4.80 round trip! ), so I showed up to the station and just hopped right on the train. 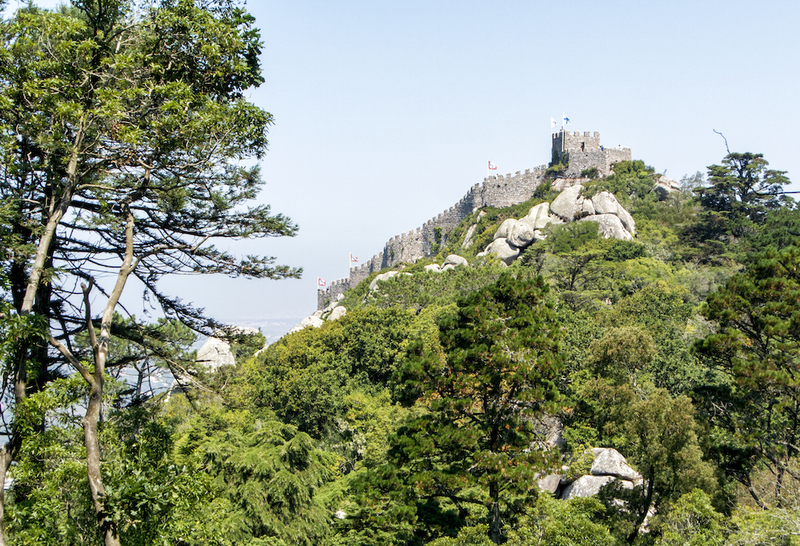 Now I knew that Sintra was a popular destination for day-trippers from Lisbon, myself included, but I wasn’t quite expecting the sheer volume that I would encounter. Once we’d arrived in Sintra, the line to get on the bus to one of the main palaces was probably a block long (when a bus arrived, I ended up being the first person to not get on, as it had filled up by the time I got to the front). I was ultimately grateful for that as that meant I was the first to get on the next bus, which guaranteed me a seat. It was a long, winding climb up a mountain road filled with other cars bound for the same destination. We eventually reached the top, and I entered my first stop of the day, Pena National Palace and Park (I’d pre-bought my ticket thankfully). I had read that the park had stables and horseback riding, and I was eager for a chance to ride a horse again (it had been over a decade). So I set off through the park in search of the stables. The park itself was vast and densely forested and had a kind of mystical serenity to it . Thankfully, because of the park’s size, the droves of people had largely dispersed, and I didn’t encounter many along the way. I appreciated the peace and quiet, enjoying the sun filtering through the trees and the sounds of running water and birds, as I made my way to the stables. There didn’t appear to be anyone around, aside from the horses, though I eventually found a couple guys (looked to be farm hands) having lunch. The guy I talked to spoke absolutely no English and explained the situation to me in Portuguese, which wasn’t super helpful. I managed to extract something about needing to go to the chalet to buy tickets, which was a bit of a hike away from the stables. I ultimately decided to forego the horseback riding and find an opportunity back home to ride horses (it didn’t look like many people were partaking in the riding tour, and I didn’t want to be the only one in any case). I meandered my way back through the park in the general direction of the palace. It was quite an uphill trek (so many hills here! ), but I did catch sight of the Castle of the Moors, a medieval castle precipitously perched on the neighbouring hilltop. Panting and sweaty, I eventually made it to the palace. Being a Romanticist palace, it drew upon an eclectic mixture of exotic architectural styles (Islamic, Manueline, Gothic, etc.). It looked almost like a Disney palace, a riot of bright colours and over-the-top style. Being atop what felt like a small mountain when I was trekking up it, it afforded fantastic views of the town and surrounding area from its parapets. The palace walls were adorned with beautiful tile work and intricate carvings, so much time was spent staring up at its grandeur. I eventually decided to check out the interiors of the palace and discovered, to my dismay, that the line to get in extended from the entrance, through a large courtyard, and out around the other side. I resigned myself to my fate, threw in my headphones and waited (I ultimately spent a lot of time, even inside the palace, with my headphones in, as it was an effective way of tuning out the din of all the people). The line moved at a glacial pace, and it was probably a good 30-40 minutes before I actually got inside. Usually, once you get inside, the hellish line experience is ameliorated as people dissipate to explore. However, the slow trudge of the line continued as people shuffled from room to room. I did notice that people were abandoning the line to move ahead if they didn’t want to see a particular room on the route and so I eventually followed suit, as I really couldn’t stand being in line anymore. I may have missed a couple ground floor rooms, but maintaining my sanity was worth it. The rooms were lovely, lavishly decorated and adorned with ornate carvings. The Great Hall was particularly impressive (as it should be, I suppose), and I spent time admiring its decadence. 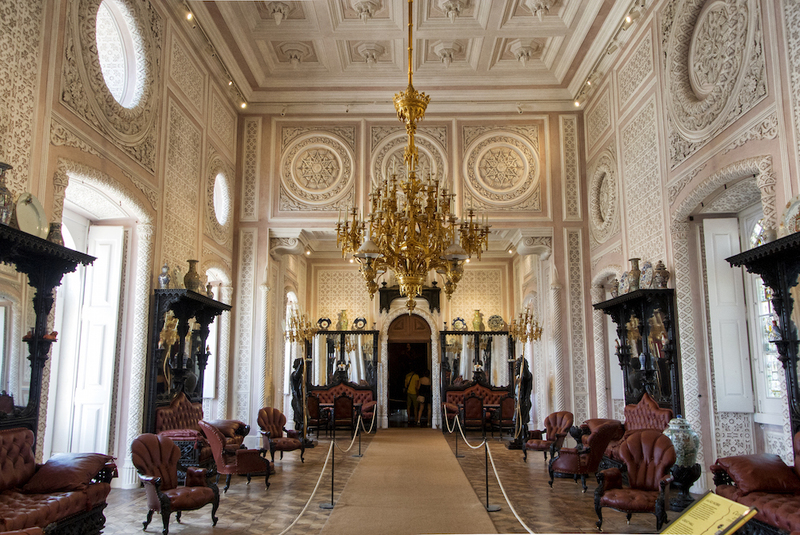 Ultimately, the network of rooms wasn’t that extensive, and it wasn’t long before I’d finished my tour of the palace. 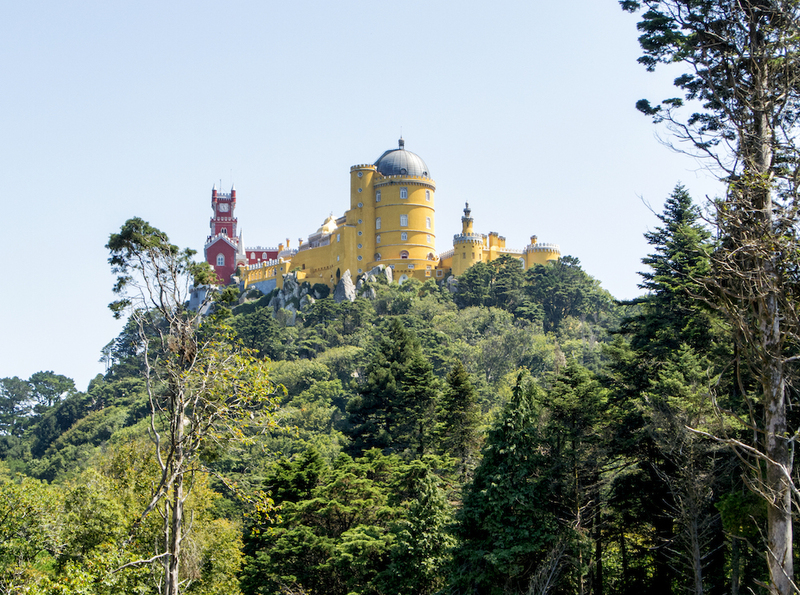 I felt like I’d had my fill of Pena Palace and Park and so I made my way back to the entrance and hopped on the bus back down the hill. During my wait in line for the bus earlier in the day, I’d noticed another bus line that ran to the smaller mansions and palaces, so I thought I’d try and catch it. Once we’d wound our way down to Sintra’s historical centre, I hopped off and managed to jog and jump on the other bus right away. 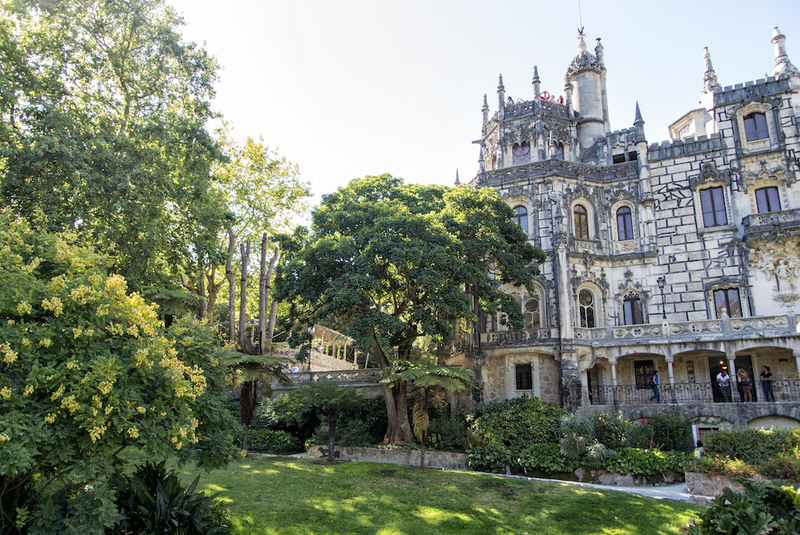 I’d wanted to see Quinta da Regaleira, a Romantic palace and park that was built by a somewhat eccentric Portuguese millionaire in the late 1800s. It was only a short bus ride away, and it wasn’t long before I was waiting in line again (thankfully shorter than other lines of the day) to get my ticket. My time in line did give me an opportunity to admire the palace’s façade, exuberantly decorated with Gothic pinnacles and gargoyles. Once I’d gotten my ticket, I set off to get something to eat at the palace café. I hadn’t had anything other than a pastry in the morning, so I was ready for sustenance. I devoured a delicious salmon and cream cheese sandwich in a lovely courtyard overlooking the palace before setting off, energy renewed, to explore the park. I loved the relatively more structured/landscaped nature of this park, punctuated by fountains and turrets (who doesn’t love a good turret?) and gardens. It also had a network of underground tunnels, one of which opens into the famed Initiation Wells, which is actually more of an underground tower lined with a spiral staircase. Its design is supposedly linked to Tarot mysticism, and it did certainly have a kind of mystical quality to it, staring up into the light. I enjoyed my stroll through the rest of the park and eventually wound my way around to the palace. Mercifully, there was no line to enter, and I was able to explore unimpeded. There weren’t many rooms on display, but they were beautifully decorated. 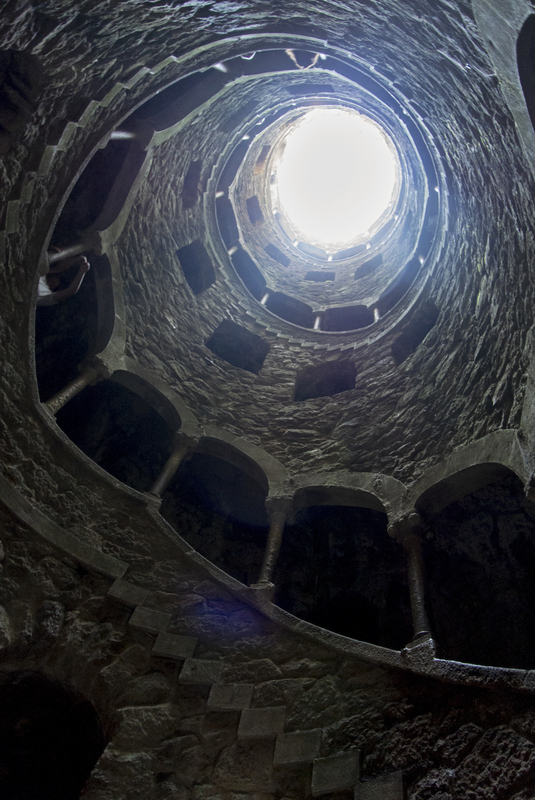 I made way up to the top of the octagonal tower, with views of both Pena Palace and the Castle of the Moors. I was also able to get a closer look at the whimsical gargoyles adorning the palace, many of which were animal characters like a rabbit and a kangaroo. Satisfied with my fill of the palace, I grabbed myself an ice cream sandwich at the café and waited for the bus back into town. I made a brief stop in the historical centre of Sintra to take a quick look around the bustling town square area before continuing onwards to the train station and heading back to Lisbon. I had a relatively early train to catch, but I was thankfully only a 5 minute walk to the station. I popped into a bakery just outside the station to grab a couple custard tarts for the road (they ended up being some of the tastiest I’d had yet, probably because they were still fresh!) and went in to find my train. I needed to go just one stop and then change trains to board one bound for Lisbon. I had managed to book a single seat (rather than a seat part of a pair of seats) on my Lisbon-bound train, so I had at least a bit of room and quiet for the roughly 2.5 hour trip. I had worked out how to get to the apartment from the Lisbon station via public transit, but ultimately I was feeling a bit tired and my bag seemed heavier (despite the addition of just one bottle of wine), so I opted to grab a cab. I ultimately think that I’ll start cabbing it when I first arrive to a new city (unless it’s extremely convenient by transit), as one never knows the particular geography of a new place. I’m glad I did, as a) it took about 10 minutes and so was cheap and b) more hills! I hauled my bag up the four flights of stairs to the AirBnB apartment I’d rented and was met by my friendly host. 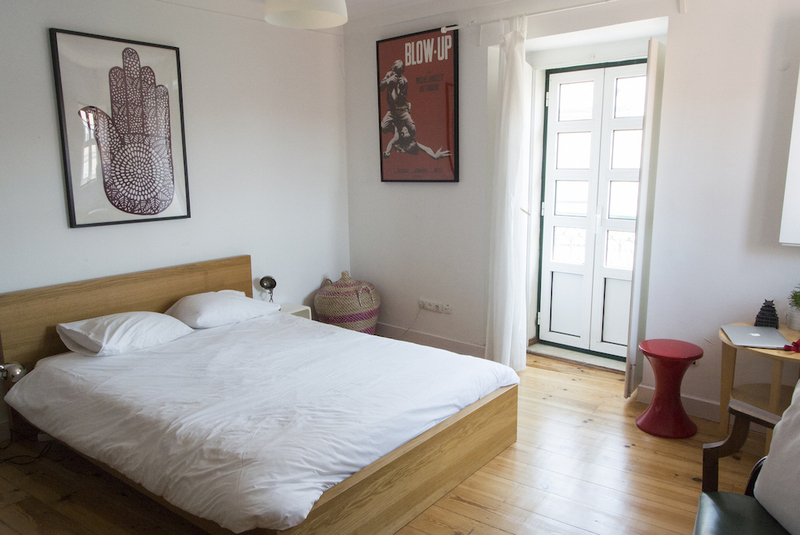 The apartment was lovely, spacious and well-equipped, and I eagerly got myself settled. As it was after noon already, I didn’t have major plans for the day, other than to get a sense for the area. I decided to take a walk up to Igreja de São Roque. 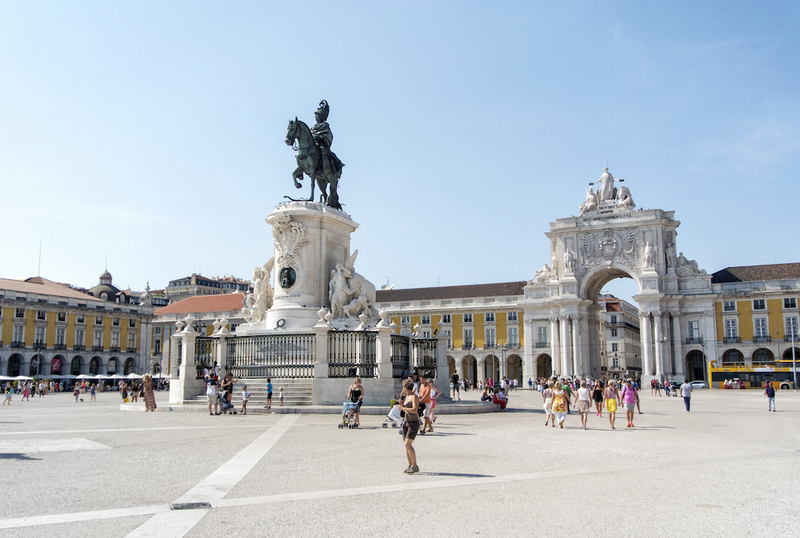 I got my first taste of the grandeur of Lisbon as I wandered through Praça Dom Pedro IV, with its ornate fountain and elaborately tiled plaza and made my way in the direction of the church, up the many stairs, through bougainvillea-lined lanes and passed restaurants spilling out onto the steps. 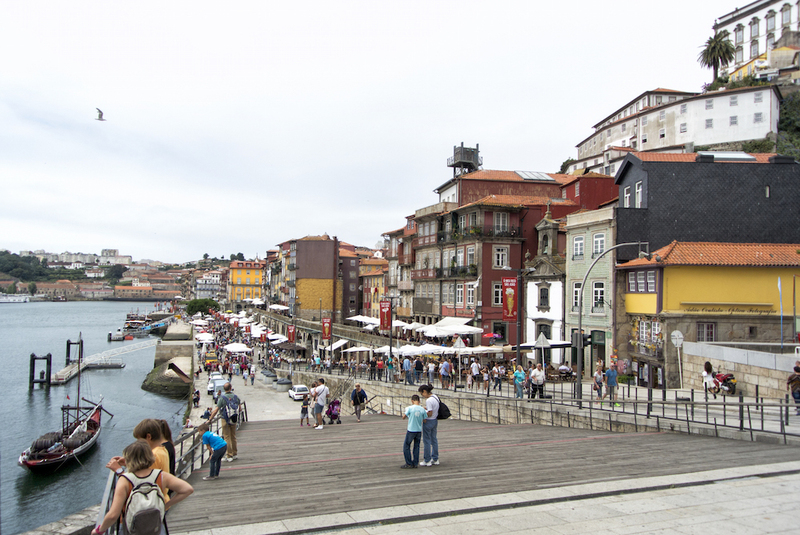 The city, much like Porto, was brimming with colour, with its ubiquitous red-tiled roofs and brightly-painted buildings. 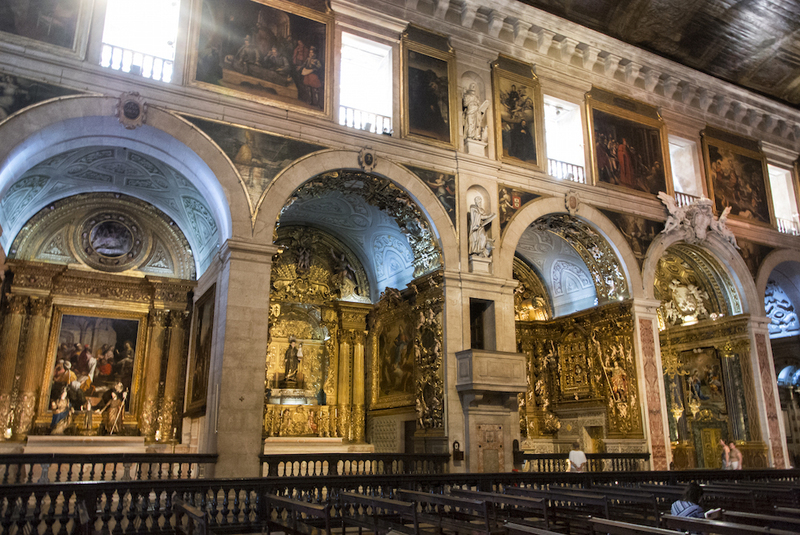 I finally made it to Igreja de São Roque and welcomed the relative coolness of its interior. 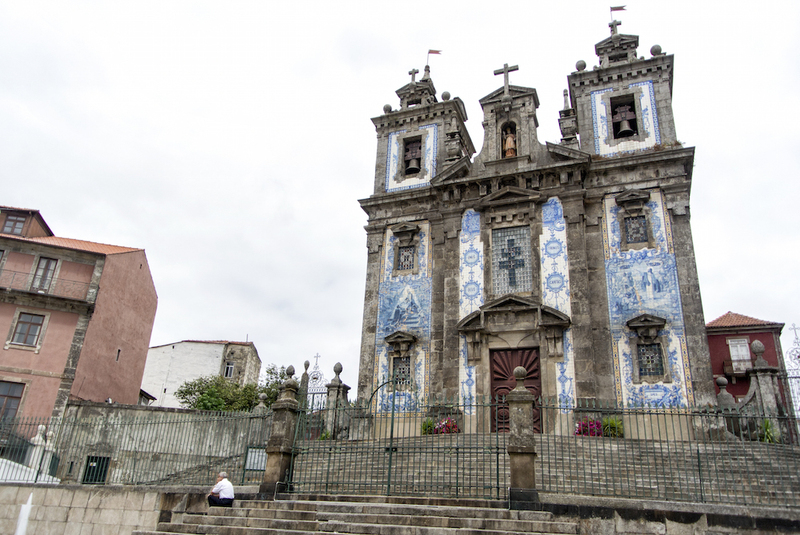 As with many Portuguese churches, the rather austere exterior did not reflect the ornateness of its interior. It had an elaborately painted wooden ceiling, which was rather surprising, and lined with gilded chapels, all gold and marble and azulejos. One of them was decorated with an abundance of cherubs and little cherub heads, which was a bit creepy. 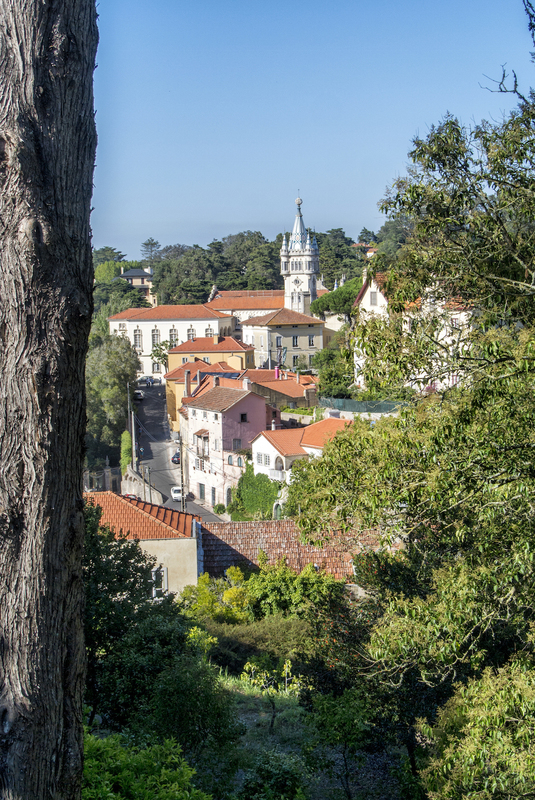 From there, I continued uphill to a nearby viewpoint in Jardim de São Pedro de Alcântara. I hadn’t eaten much other than my custard tarts, so I grabbed a couple of scoops of gelato (which were just divinely good) and enjoyed the gorgeous view overlooking Lisbon. A light breeze and shady areas to sit made it a lovely introduction to the city. 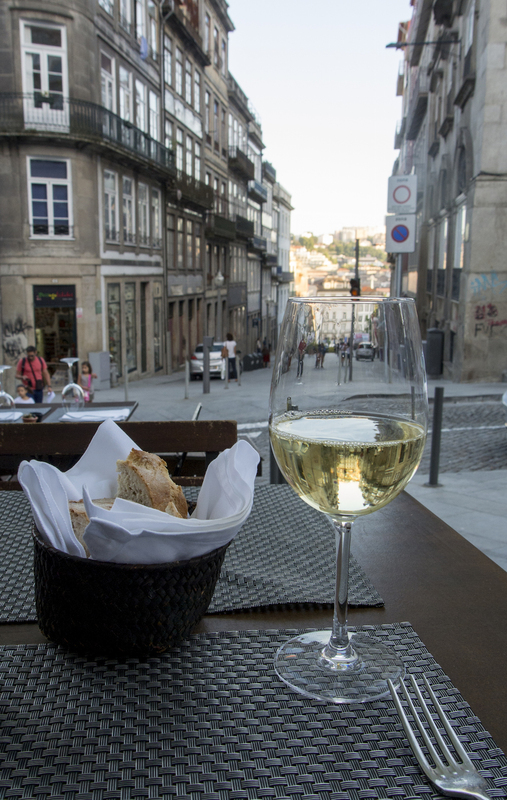 After I’d had my fill, I made my way back down the hill into the Baixa district, an elegant area of town with wide boulevards, lined with shops from international brands and a goodly number of tourist-laden restaurants. I noticed a rather dramatic arch at the end of one of the streets, so I thought I’d investigate. It turned out to be the triumphal Arco da Victória, centered on the truly massive Praça do Comércio. I basked in the sun for a time while admiring the scale and grandeur of the square before making my way back to the apartment to recharge for a bit. I did a bit of investigating as to reputable, tasty restaurants in the neighbourhood and decided on a little wine bar in the nearby Alfama district (up yet another hill). Unfortunately, when I got there, all their tables had been reserved, so I went in search elsewhere. My AirBnB host had recommended the little neighbourhood joint just around the corner from the apartment, so I figured I’d give it a try. It definitely felt like a local spot, as the older lady who sat me didn’t speak English, and there was no English menu available (just a menu written in Portuguese on a whiteboard). I ordered a glass of wine, and she asked me “meat or fish?” to which I responded “fish”. She then listed various fishes in Portuguese, and I went with the one I recognized (cod fish). The place was soon bustling with locals and a few tables of somewhat bewildered looking tourists. I eventually got my plate of cod topped with onions and what looked like grated cheese with a side of potato chips (what I assumed to be the “house” fish dish they give to the tourists). It was fairly tasty and relatively inexpensive, so I ended up enjoying another glass of wine before calling it a night. 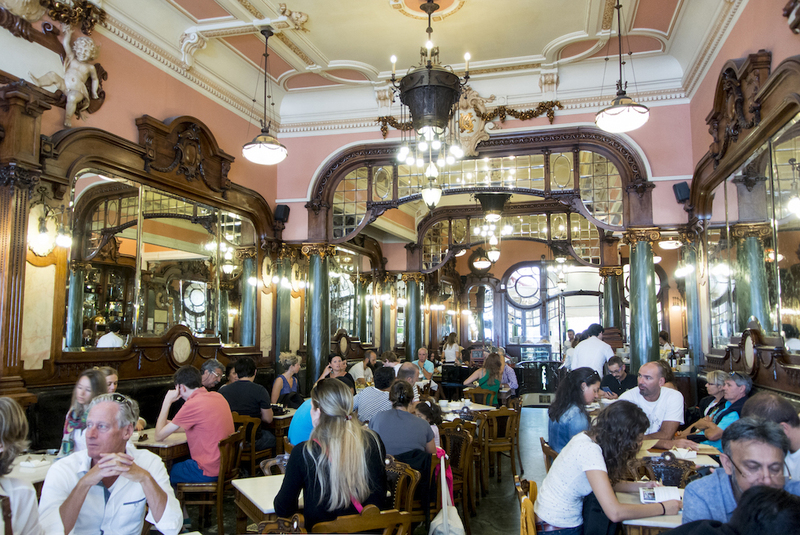 After a relatively lazy start to my day, I headed off in search of Porto’s famed Majestic Café. Opened in 1921, it is a pretty little spot living in the splendour of the Belle Epoque era, with marble table tops, gorgeously engraved leather banquettes and liveried waiters. I ordered their “Majestic” French toast along with a pastel de nata and a hot chocolate, and happily people-watched while I ate my tasty treats. I didn’t mind that most were other tourists because the interiors were pretty enough to keep me occupied (and the goings-on of other tourists is always fascinating). After I’d had myself a lovely brunch, I made my way up Rua de Santa Catarina, a largely pedestrianized shopping street lined with a mixture of moderately-priced international brands and what looked like local shops. I did pop into Massimo Dutti, a Spanish clothing company I just love that I discovered when in Hong Kong (we don’t have a brick-and-mortar store in Chicago), but ultimately my credit card made it out unscathed. I continued up the street to the striking Cappella das Almos, clad almost entirely in azulejos. It was definitely the most abundant use of exterior tile work I’d seen thus far. I wandered my way down to check out the nearby market (Mercado do Bolhaõ), thinking I might pick up some cheese or other tasty treats for the road. Ultimately, it was a little underwhelming, as there weren’t a huge selection of stalls and felt a little run down. I made my way back past the train station and up a rather arduous hill (did you know that Portugal was hilly?) to check out another azulejos-clad church (Church of Saint Ildefonso). I had originally planned to go back past my apartment to climb to the top of a church tower to get a view of the city, but I was in full wander mode and ended up discovering, somewhat by happenstance, the entrance to the upper deck of Ponte Luís I to cross the river as well as Sé do Porto (Porto Cathedral). Sé is such an imposing, fortress-like building (I had originally thought it was some kind of fortified castle). It’s actually a little foreboding from certain angles. It was also high enough to afford some pretty darn lovely views of the city–all my hill-climbing had paid off I suppose–so I nixed my plan to climb a church tower and happily admired the view I’d found. The interior of the cathedral reminded me a lot of York Minster, with these massive, tree trunk-like pillars soaring upwards. The cathedral dates back to the 13th century but was worked on until 1737. The chapels were fabulously ornate, with a combination of marble and gilded-wood carvings, which seems a popular choice here. The Gothic cloisters were probably my favourite, as they were lined with azulejos, giving them a distinctly Portuguese flair. I spent a fair time wandering my way through the various rooms, gaping up at ceilings and admiring the often elaborate fixtures. The sun had also come out at this point, which instantly elevated my mood, and I found myself walking around with a smile on my face (because sunshine!). Since the entrance to Ponte Luís I was literally around the corner from Sé, I figured I should just commit to making the trek across the bridge. It had turned out to be a brilliantly beautiful sunny day, if not rather windy atop the upper deck, which was thankfully only open to pedestrians and trams. I did realize that I probably have a mild phobia of heights, not enough to prevent me from actually going up high things, but definitely enough to give me this bizarre sensation in my legs when I approach the edge (I’ve noticed this before when I’ve gone up high church towers). The wind didn’t help my sense of stability, so I made my way across rather carefully. I did enjoy the spectacular views back of Porto, with the town draped so elegantly on all those hills I’d been climbing. I eventually made it across and thought it might be fun to ride the urban gondola, which essentially takes you from the high hilltop that connects with the bridge to the other end of the waterfront. I’d noticed them buzzing across the skyline when looking over from the Porto side. It was a short ride, but it did provide a lovely view of Porto. 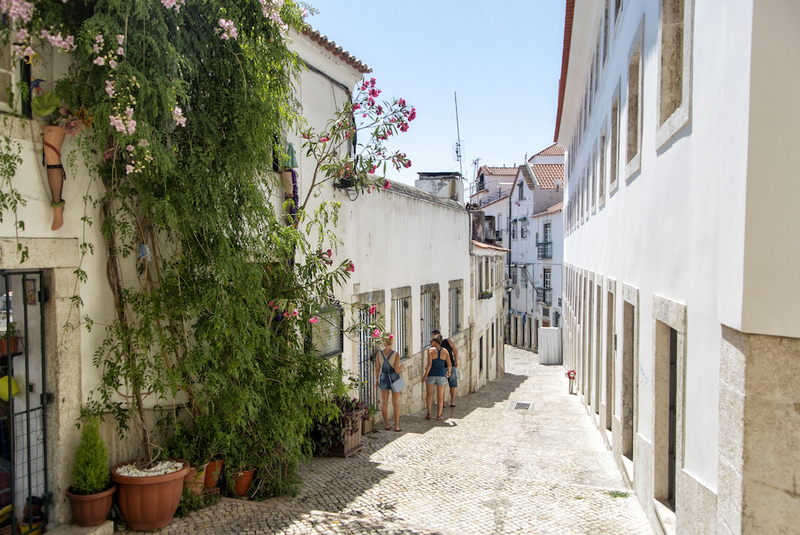 Vila Nova de Gaia, which is the town across the river from Porto, is home to the famed Port wine cellars (known as ‘caves’ here). I figured I’d go to one of the wineries and have myself a tour. I’m not really a Port drinker, but when in Rome right (or Porto in this case)? I’d heard that Taylor’s was a good tour, so I hiked up the hill in search of it. However, after much upward trekking, I couldn’t seem to find it. Hot and sweaty, I ultimately gave up and went down to another winery that I’d passed on the way up, Cockburn’s (pronounced “Coburn’s” before anyone gets too amused). Unfortunately, their English tour wasn’t for another hour and a half, so I amused myself with their free wifi for a time (I love the wonder of technology these days that allows me to make a free voice call via FaceTime to David halfway around the world!). I still had another hour or so to kill, so I took a walk around the area, as I didn’t really want to trek back down the hill again. I stumbled across a random park just around the corner (Parque da Quintas das Devesas) that looked to be almost completely deserted. 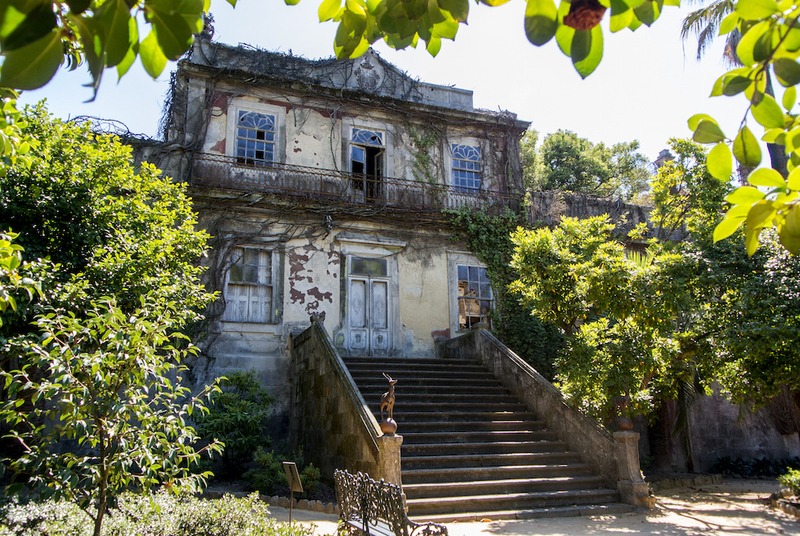 While the grounds looked to be kept up, there were some beautifully dilapidated old buildings on the grounds–something so elegant about their crumbling state, nobly sitting there marking the slow passage of time. The park itself was peaceful and pleasant, though out of season, as there were many beds of rose bushes that were no longer in bloom. I amused myself by playing with my camera timer and doing an impromptu outfit shoot in the park, since there was no one around (check out the results of my efforts here). All the camera balancing on my purse/wallet and running around within 10-second time limits did serve to pass the time. It also made me appreciate even more having my fabulous husband photographer do that work for me normally (it is truly much more cumbersome without a tripod and a remote to do it oneself). 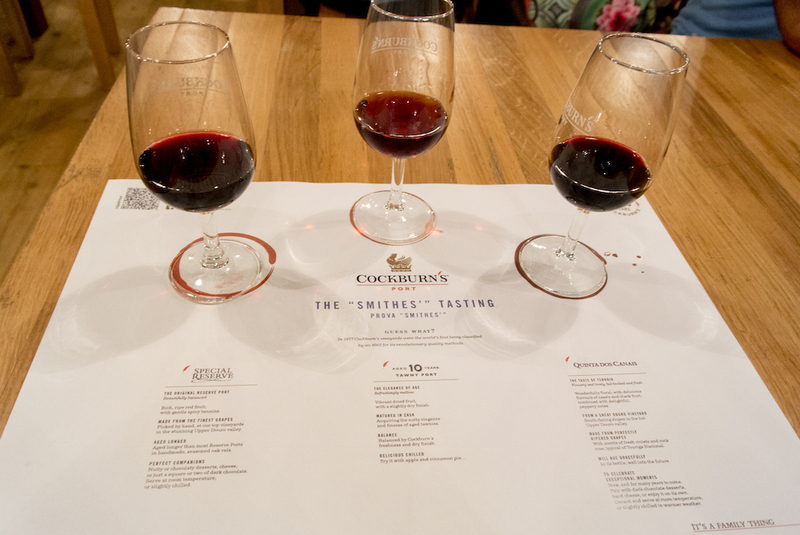 It was soon time for my Port wine tour at Cockburn’s. We were taken around by Gabriel, our animated tour guide, who explained the differences between ruby and tawny ports and showed us the different barrels and vats that they’re aged in. We talked about the (brief) fermentation process and the differences between regular Port and “vintages”. The tour finished up with, of course, a wine tasting. I’d paid a little bit extra to try three (rather than just two) different Port wines. It was definitely the most Port I had ever consumed in one sitting, and I was left pleasantly warm from my efforts. I actually quite enjoyed them, particularly the ruby ports, and ended up buying a bottle of Quinta dos Canais Vintage Port (2007) to take home with me. A slightly pricier option than their regular Port wines, but we often take home a nice liquor (think Scotch or gin) when traveling, and there is nothing more quintessential to get from Porto than Port. I ambled my way back down to the waterfront to take in the Porto view, bathed in a ruddy sunset glow. 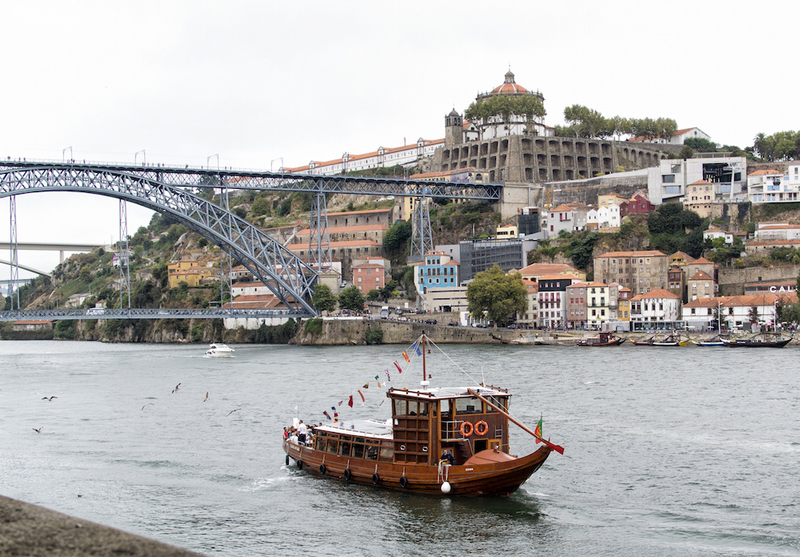 It was a breezy walk down the esplanade, watching the boats come and go and some adventurous boys diving off the lower deck of the bridge into the Douro River. I made my walk across the lower deck (which is open to traffic) along the rather narrow pedestrian walkway. As it had been a fairly long day, I didn’t really feel like going around to different restaurants and reading their menus to try and find dinner, so I beelined back to a restaurant I’d passed by on the first day, nearer to my apartment, called Traça. I grabbed a seat on the outdoor patio and enjoyed the sounds of a clarinetist jazzing it up in the nearby square. I ordered myself a green wine (vinho verde), which is their “sparkling” wine, though it wasn’t terribly effervescent (tasty though!). I started with some delicious croquettes filled with prosciutto and eventually had a main of boar loin stuffed with foie gras and goat cheese. I was being adventurous (for David’s sake) by having boar. I imagine my adventurousness was spurred on only slightly by the promise of foie gras and cheese. I say eventually had my main, as the only thing that really marred the meal was the exceptionally slow and somewhat absent-minded service (forgetting my drink, taking ages for food/the check). I’m a fairly patient person when it comes to service, but even I was eventually craning my head around to try and spot my server. Normally, such things don’t bother me as one usually has a dining companion, but when traveling alone, you are very much aware of the passage of time (I made it through many games of solitaire on my phone, needless to say). Nevertheless, the food was tasty, and one must focus on the positive! I’m dining on a patio in southern Europe for goodness sake. There really isn’t much to complain about in the end. I love to travel, and this wanderlust often necessitates traveling alone (as David will have work or we’re too poor to fly both of us somewhere). 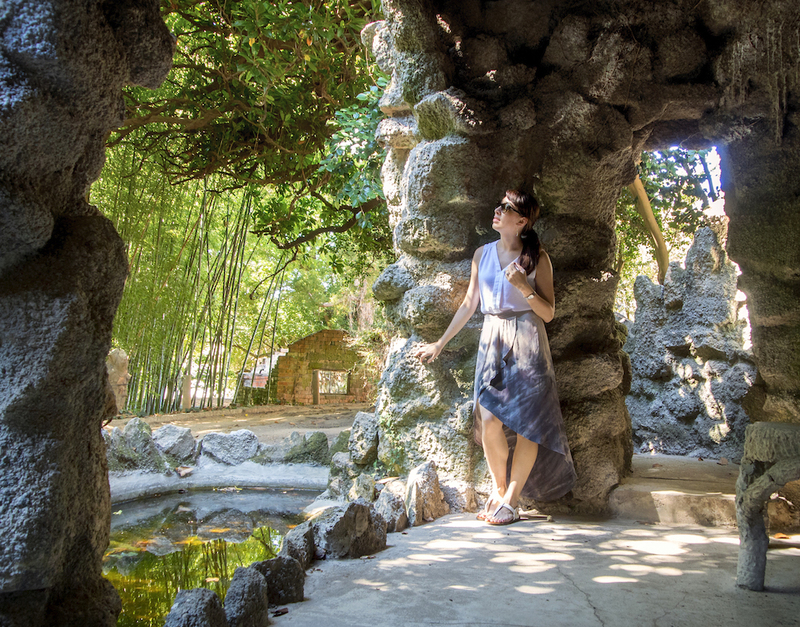 I don’t mind being a solo traveler, though getting pictures of oneself is always a bit of a challenge, usually resulting in some awkwardly-framed, slightly out of focus snapshots taken by well-meaning fellow tourists. 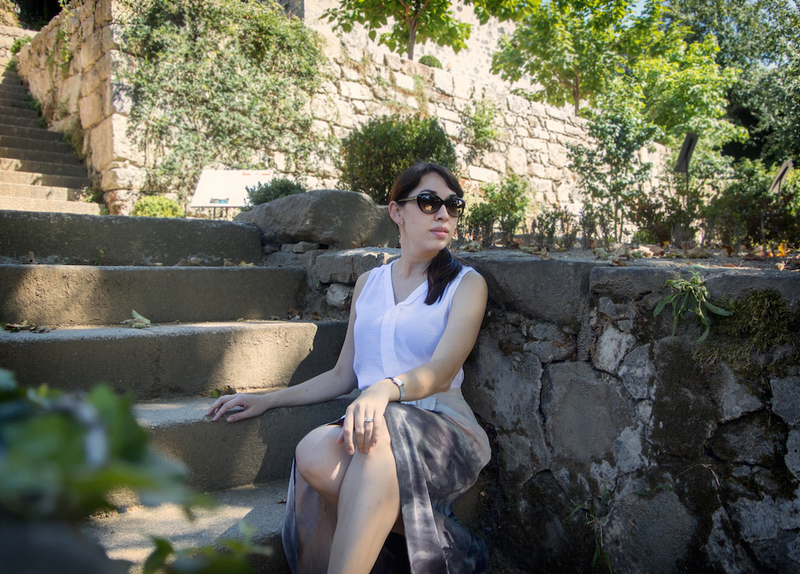 As you may have noticed, I’m currently poking around Portugal and spent a lovely afternoon the other day across the river from Porto in Vila Nova de Gaia. This is where most of the Port wine caves are, and I had a couple hours to kill before my wine tour. Just around the corner from Cockburn’s (the Port winery I would be visiting), I stumbled across a lovely little park that was almost completely deserted, so I thought I’d amuse myself by playing with my camera timer and do a little outfit shoot. Let me say that I do immensely appreciate my fabulous husband for normally taking the outfit photos, as it is exceedingly cumbersome to set up (particularly without a tripod) and run around within the 10-second timer limit (hence the somewhat limited number of photos/angles). Nevertheless, it was vastly entertaining. 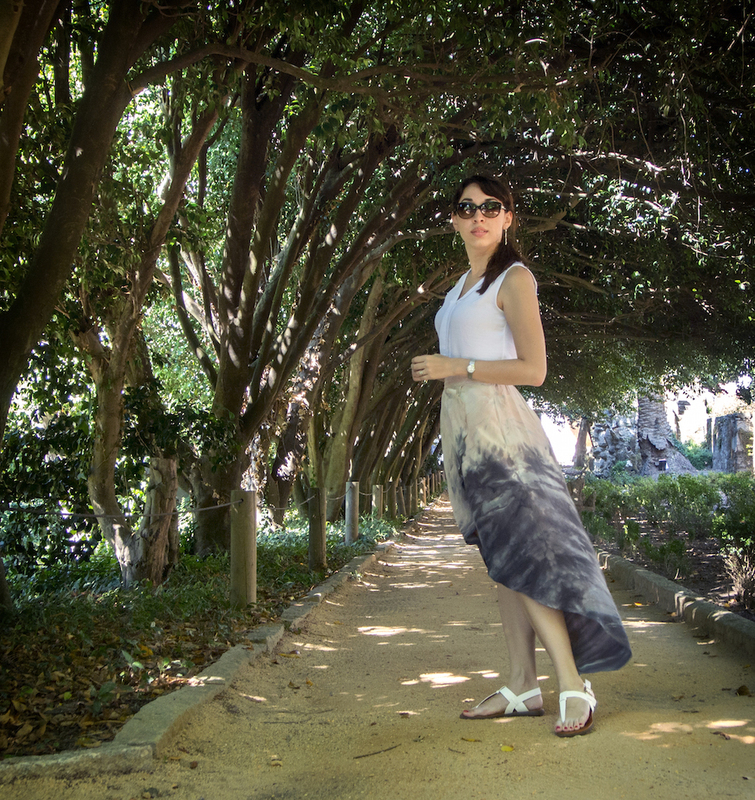 I’m loving this skirt here in Portugal, as it has a light, airiness to it, fluttering nicely behind me as I walk. I’m trying to find a balance between presentably dressed but also comfortable enough to walk around all day, and this outfit definitely fits the bill. 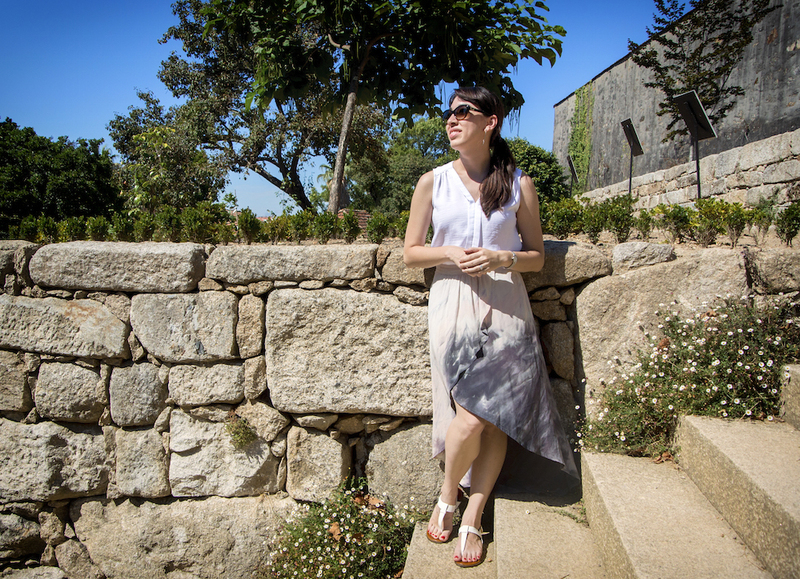 Having a few light, breezy pieces are certainly summer essentials, and they have served me well in southern Europe. 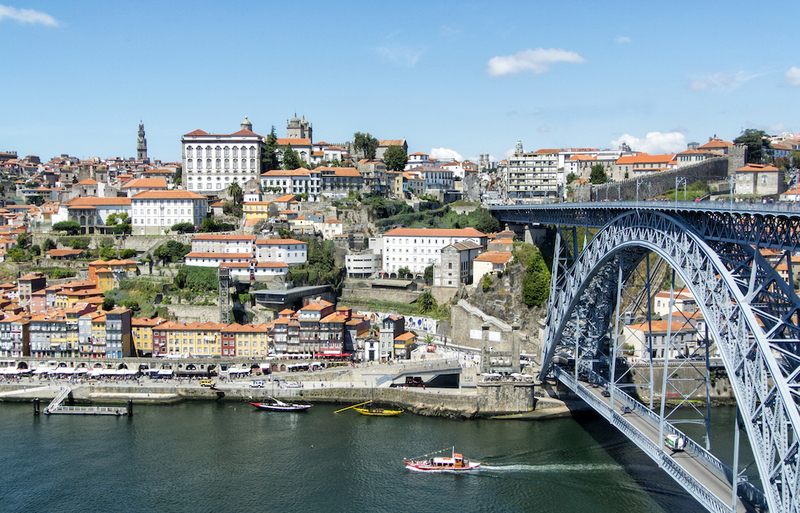 Porto would be the first stop in a brand new country for me! 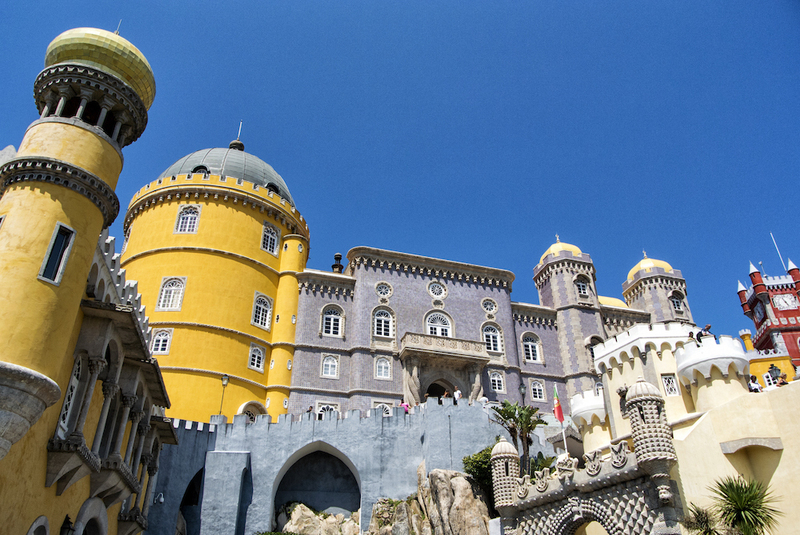 I know very little about Portugal–their culture and even their food (other than their famed egg tarts, I don’t know that I’ve ever had Portuguese food). I usually take the opportunity afforded by getting airfare covered to attend an academic conference to wander for a week or so afterwards. I had literally stared at a map of Europe to consider where to go after Glasgow and thought that a sunny sojourn in southern Europe (particularly after the veritable fall-like weather in Scotland) sounded like a brilliant idea. Hence, Portugal! I’d arrived at the Air BnB apartment the previous evening around 8 pm, so other than popping across the street for dinner, I hadn’t yet seen any of the town. As I tend to do when traveling alone, I got a rather luxurious start in the morning, setting off to see the city around 11 am. While I had a list of sights prepared, I thought I’d get the lay of the land by just wandering in the general direction of the waterfront. Despite my desire of warm summer weather, it was actually quite cool (about 20 C) and cloudy in Porto.It wasn’t long before I passed the impressive Avenida dos Aliados, a sloping boulevard lined with beaux-arts façades and with Town Hall at its peak. 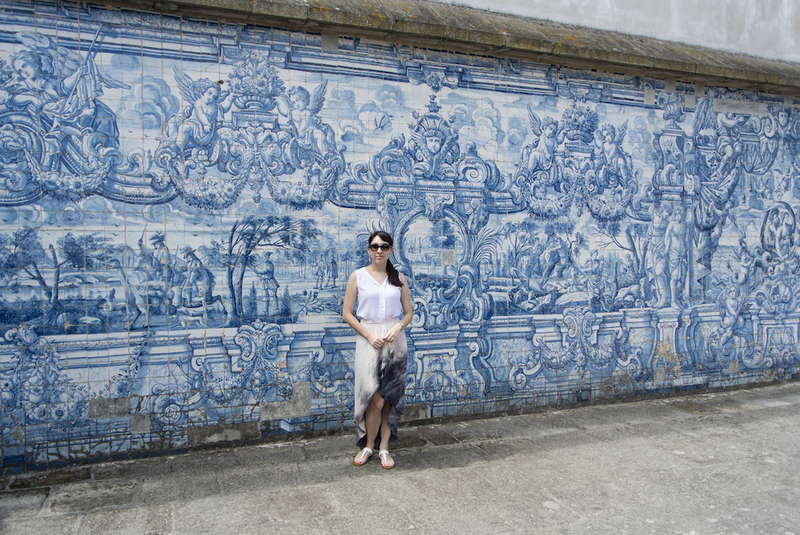 From there, I popped my head into São Bento train station for a peek at the azulejos-covered walls. Azulejos are tin-glazed ceramic telework, which are a dominant part of Portuguese architecture. I will definitely have to find a souvenir tile to take home with me! From there, I strolled down Rua das Flores, a pedestrian-only street lined with cafés and shops (many of which were closed, as it was Sunday). I mentally noted some delicious-looking gelato and chocolate places to return to. There were a surprising number of tourists, by far outnumbering the locals. I suppose I hadn’t thought that Porto was as prime a destination as other places in Europe, but I am here in peak season. 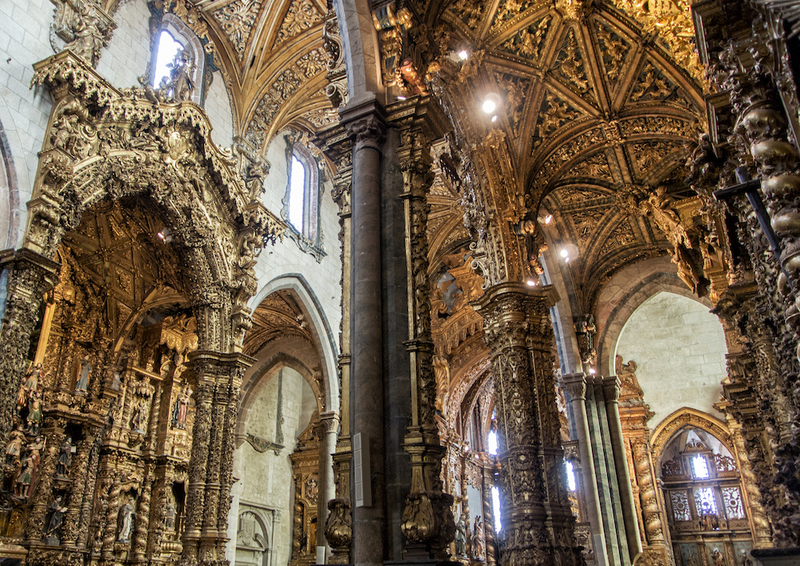 It wasn’t long before I reached the Ingreja Monumento de São Francisco, renowned for its elaborate interiors. The exterior of the Gothic church was severe and austere, standing in stark contrast to the opulence of its interior. They didn’t allow photography, so I practiced the art of “shooting from the hip” (one of the advantages of having a silent shutter). Though I did occasionally duck behind a pillar to get a shot. The lavish gilt wood carvings covered almost all surfaces (purportedly about 400 kg of gold in all), and I sat in a pew and simply stared up at it all, trying to take it all in. The sun was starting to peek through the clouds as I continued my downhill descent, through the winding medieval streets of the Ribeira district to the Cais da Ribeira. I’d read somewhere that the Ribeira was a “crumbling but fantastic” place, which I think is an apt description. Peeling paint and crumbling stonework in places did not detract from the vibrancy of the area. Unsurprisingly, the area was tourist-central and stalls lined the boardwalk, flogging their wares (a disturbing number of sellers were roaming about trying to sell selfie sticks…sigh). 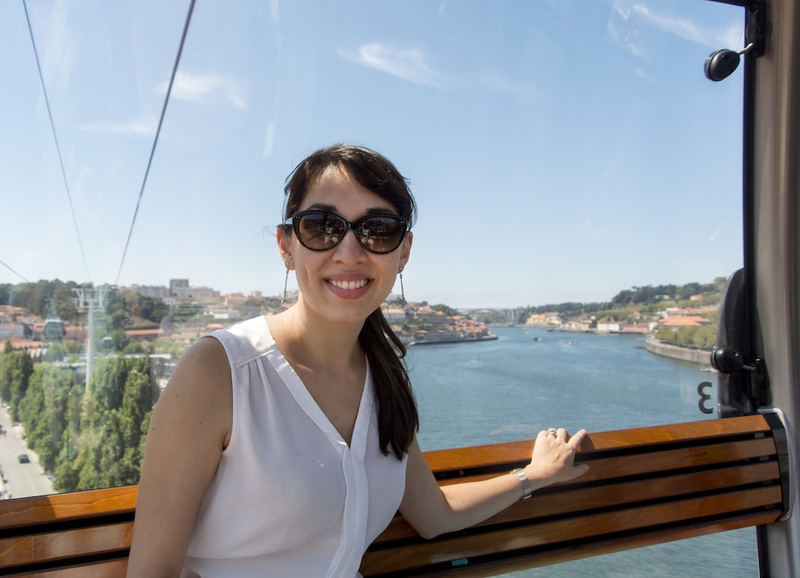 I wandered my way through the narrow, medieval streets over to Ponte Luís I, a metal arch bridge spanning the Rio Douro connecting Porto to Vila Nova de Gaia. Fun fact: it was designed by a student of Gustave Eiffel and was the longest of its type in the world when it was built. I was definitely in need of food at this point, so I made my way back in the general direction of the apartment along the Rua das Flores. I came across a cute little café, Chocolataria das Flores, which looked to be just what I needed. I grabbed a seat outside and enjoyed my lasagna in the now sunny (and warm) weather. I headed back to the apartment to get in a bit of work and a little afternoon sesta. I used to feel guilty if I didn’t pound the pavement the whole day, getting in the full experience and seeing as much as possible–as if I were somehow cheating myself and not taking full advantage of the opportunity of being there. These days I don’t mind not seeing everything and am ultimately happy to divide up the day with quieter rest periods (maybe it’s age/laziness). I eventually got myself going and decided to head back down to the waterfront to find myself a dinner spot. There were, unsurprisingly, a large number of restaurants to choose from, each with their own little patio spots along the narrow walkways overlooking the river. The only disadvantage of this is of course that you will have people walking through occasionally. I managed to find a recommended restaurant, Vinhas d’aloo, but was about half an hour early for dinner (they don’t usually serve dinner until around 7 pm). I was, however, happy to sit and enjoy my view across the river of the Port wine caves with a glass of sparkling wine. 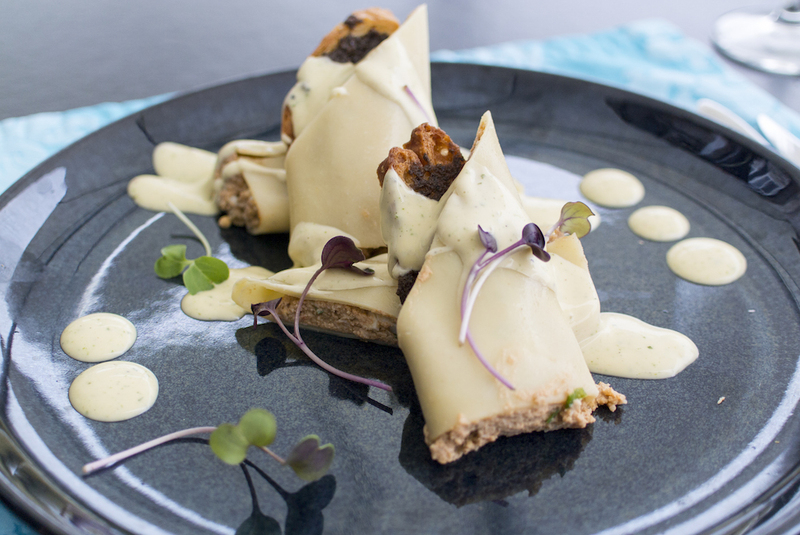 I decided on crab cannelloni to start with and golden (sea) bream for my main. The crab dish was served cold and was super delicious, creamy and crabby (just the way I like it). My bream arrived as a whole fish, so I went to work on de-boning it. It was lovely and flavourful, uncomplicated by sauce or anything more than lemon. At some point during dinner, it started lightly misting. Thankfully, all the outdoor seating had umbrellas open, but I did feel the occasional drop. I thoroughly enjoyed my meal nonetheless and was warmed by my wine all the way back through the rain-splattered streets.